Back cover blurb:“We have a dead child, and a crime scene that has been remarkably well kept for us.” A young child lies mummified in a barrel. His hands, cable-tied, appear to be locked in prayer. As forensic officers remove the boy they are in for an even bigger shock – he is not alone. With his near-fatal stabbing almost a memory, DI Bob Valentine is settling back into life on the force but he knows nothing will ever be the same. Haunted by unearthly visions that appear like waking dreams, he soon understands he is being inducted into one of Scotland’s darkest secrets. When the boy in the barrel is identified as a missing child from the 1980s, it re-opens a cold case that was previously thought unsolvable. When further remains are unearthed, the facts point to a ring and a political conspiracy that leads all the way to the most hallowed corridors of power. 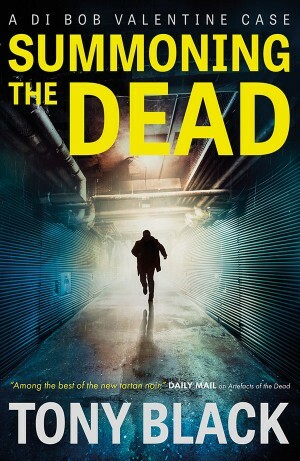 Summoning the dead is the first Tony Black novel that I have had the pleasure of reading, and I wish I had discovered this author before..
Detective Bob Valentine is a very likeable down to earth kind of bloke. Having survived a near-fatal stabbing his wife is keen for him to either leave the force or take a demotion. But Bob loves his job and he is determined to fight for truth and justice, no matter how dangerous that may be for himself his career or his marriage. When the horrific discovery of a small boy’s body in an ICI barrel is uncovered, Bob is quickly assigned to the case. Upon realising that the boy’s body has been undiscovered for years, preserved in the confines of the barrel, Bob is more determined than ever to get some justice. When the gruesome discovery is made that the boy was not alone in the barrel, the investigation takes a darker turn. Summoning the dead seems somehow harder and more realistic than some of the fiction in its genre and for that it’s author can only be applauded. To keep a prolific reader hooked from start to finish is no mean feat. An excellent crime novel, and I shall be seeking more from this author. Summoning the Dead is available now via Amazon online and all good book shops. Thank You to the publishers who sent me advanced copy of this novel in exchange for an honest review.